Atlantyca Entertainment’s Geronimo Stilton is about to share a wonderful chocolate treat and gift. 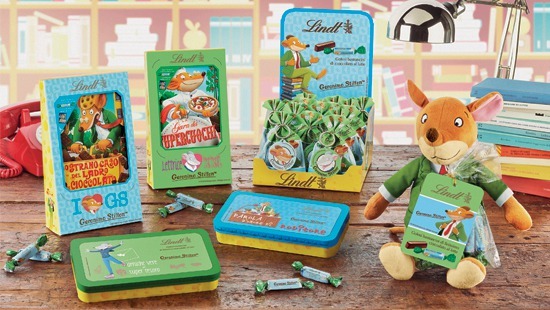 The company has signed with leading premium chocolatier Lindt & Sprungli S.p.A to produce a selection of branded Geronimo Stilton mouth-watering chocolate pralines. The pack of chocolates will feature Geronimo Stilton on the wrap and will include a very special Geronimo Stilton themed gift with it inside. A selection of four different gifts are being offered: key ring, pencil case, plush and a selection of the popular Geronimo Stilton books that young fans have come to know and love. “Lindt is a premiere chocolatier, dedicated to creating high-quality chocolate products,” noted Marco Piccinini, manager licensing for Atlantyca. “We always strive to find partners that uphold the highest-regard for their brands and ours. We are so excited to be able to incorporate some of the wonderful Geronimo Stilton books into this special promotion, it is the heart of the brand and part or our continued work in bringing multi-faceted promotions.” The Geronimo Stilton themed chocolates will be sold in local pastry shops, ice cream and chocolate confectionary shops. Lindt & Sprüngli is recognized as a leader in the market for premium quality chocolate, offering a large selection of products in more than 120 countries around the world. During 170 years of Lindt & Sprüngli's existence, it has become known as one of the most innovative and creative companies making premium chocolate.